The appearance of multicellular animals occurs in an event known as the Cambrian explosion. Soft parts, such as skin impressions of dinosaurs, and soft-bodied animals like jellyfish are sometimes preserved, and in some localities may be common, but they give us only brief glimpses of evolutionary histories. Obviously we have no record of the origin of life, and little or no evolutionary history of the soft-bodied organisms. It is hardly surprising, then, that we have so many gaps in the evolutionary history of life, gaps in such key areas as the origin of the multicellular organisms, the origin of vertebrates, not to mention the origins of most invertebrate groups. The creationists, of course, just love to draw attention to these gaps, which they score as points against evolution. We saw ... though, that their case is without foundation, because they have ignored vital evidence from the living world. The appearance of multicellular animals occurs in an event known as the Cambrian explosion. There are few ancestors to these animals in the underlying layers. The appearance and diversity of these invertebrates cannot be explained on the basis of mutations accumulating and being selected for over time. The origin of multicellular life from a group of colonial organisms is a stretch of the imagination and is not based on any physical evidence. The evolutionary relationships are based on assumptions about how the embryos develop and the similarity in their molecular structure. The many complex structures, such as gills, lungs, digestive systems, muscles, and flight structures, that had to evolve did so without a known mechanism. According to evolutionists, as these organisms continued to evolve, they invaded the land and had to overcome the many challenges that they faced there. Competition for resources, both in the sea and on land, caused a wide variety of body plans to develop. These “evolutionary milestones” occurred at unknown dates and rates, but they must have happened in order for evolution to be true. The presence of many invertebrates that are “living fossils” casts doubt on the way that evolution has occurred. Do hundreds of millions of years lead to change or stability? From the creationist perspective, the sudden appearance of complex life and the presence of “living fossils” are totally consistent with biblical creation. The special creation of diverse organisms and the degree of change within the created kinds over several thousand years is consistent with the evidence seen in the fossil record. Invertebrates are certainly the most abundant animals on earth, but how did they get here and how did all of their diverse forms come about? In one of the more popular hypotheses in the evolutionary story, the single-celled organisms (discussed earlier) supposedly began to form colonies. Colonies offer these organisms an unknown advantage; so natural selection leads to more and more colonies. As time passes, these colonial organisms start to develop specialized cells and then form into a ball with an indentation that can ingest things and take advantage of a new food source. Exploiting this new food source leads to more advances, and eventually there are thousands of different invertebrate life forms swimming in the ancient seas. One problem—there is no fossil evidence for the story. The story is based on the comparison of DNA sequences (which relies on many assumptions as discussed earlier) between organisms and a presumed common ancestor. 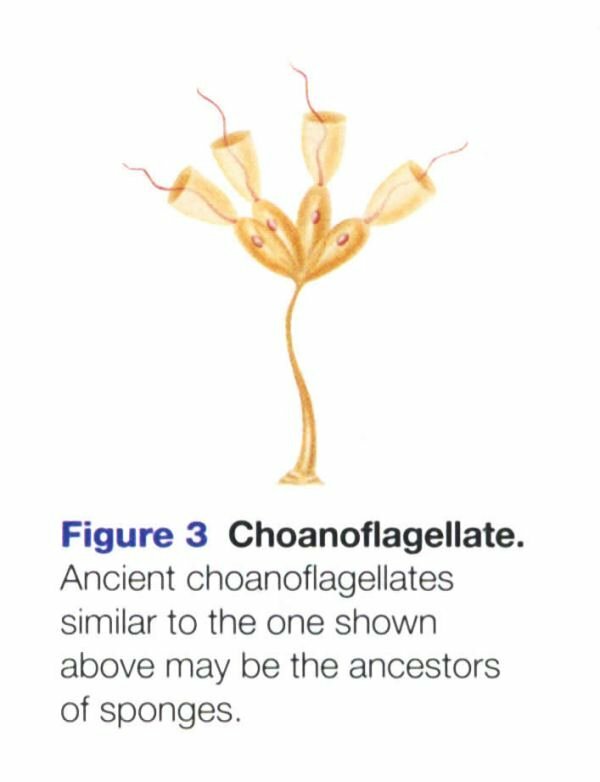 The simplest animals, sponges, are supposed to have evolved from ancient choanoflagellate protists based on the fact that the larval stage of sponges looks similar to other choanoflagellates that exist today. This could be explained as convergent evolution, but it is used as proof of common descent in this case. Within the evolutionary sequence of events, the mechanisms that made the changes are not known, and they cannot be known. Again, the lack of testability and repeatability demonstrates how this subject lies in the realm of historical science, if it is science at all. In order for the colonial protists, or even unicellular protists, to become truly multicellular organisms, an amazing change must happen extremely rapidly. Unicellular organisms cannot produce more than one type of cell. In order to become a multicellular organism, new information must be available that tells the cells to develop in new ways to perform different functions. The source of this new information cannot come from random mutations (as discussed in Chapter 3), but even if it could, a multitude of new functions must be simultaneously added to the genome. The hormonal control of development and cell coordination must be present with the information to code for the hormones and new cell structures. It is insufficient to say that old hormones and proteins get used in a new way because those old hormones and proteins must still perform their original functions or the cell is not as fit and would be removed by natural selection. Considering this transformation, one cell from the colony has to “know” how to do all of the jobs that the other cells were doing and gain that information from those cells. After it has gained the information, it must then direct the different cell types and orchestrate when the genes are turned off and on within each cell, activities that are not required in unicellular life. The lack of any evidence for this type of evolution makes the scenario that much more unlikely. At least 95% of known fossils are of invertebrates, but the picture of invertebrate evolution is still very fuzzy. The major reason for this is the sudden appearance of fully formed invertebrate body plans in the fossil layer that records what is known as the Cambrian explosion. The ancestors to the variety of multicellular invertebrates are not known from fossils. Some traces of multicellular life are found in Precambrian rocks but not the types or abundant variety that would be expected from the diverse organisms in the Cambrian rocks. The cladograms and phylogenetic trees shown in the textbooks differ in their major branching points, and the changing nature of DNA and molecular evidence means that by the time a text is published, the ideas about ancestry may have changed. These models of evolutionary history are just speculative interpretations, and different groups within the scientific community come to different conclusions when they weigh the evidence with different assumptions and biases. 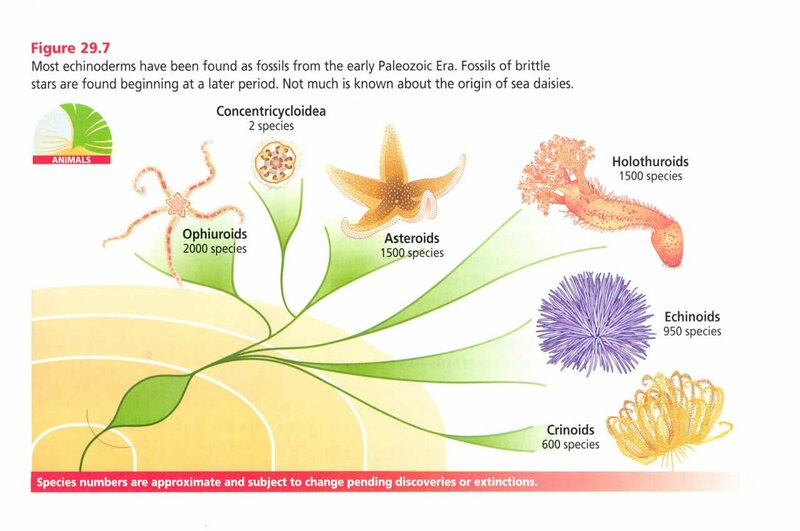 This illustration shows a representation of some of the forms that appeared very suddenly in the fossil record during the period known as the Cambrian explosion. In the creationist model, these animals represent descendants of original created kinds that became extinct during the Flood of Genesis. Gradual evolution cannot account for the sudden appearance of so many types of life. 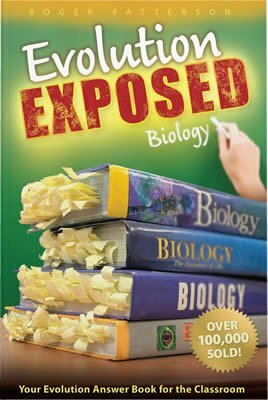 As you read through the evolutionary story in textbooks, you are expected to accept as fact a multitude of just-so statements even though those stories include details that cannot be known. You will see phrases that assume that certain things must have occurred in order for them to exist as they do today. For instance, evolutionists “know” cells must have formed in the ancient oceans because we have cells today. The major advances in invertebrate body plans are treated in this way. The development of soft-tissue features, like nervous systems and body cavities, is rarely preserved in fossil specimens. A statement like, “The development of bilateral symmetry was an important evolutionary adaptation that allowed animals to respond to their environment and compete better for resources” sounds logical, but it is not based on evidence. This statement is not true in itself, but it is a corollary to the evolutionary story. These are often referred to as evolutionary “milestones” or “key adaptations” because they needed to happen for a new kind of organism to form. When you read a statement like this or any statement that expects you to accept something as fact, remember that these are interpretations based on evolutionary assumptions. It is also important to remember that these ideas have probably changed in the recent past and will change in the near future as naturalistic scientists reinterpret the evidence with ever-changing ideas. While change is expected in science as new knowledge is gained, the fact that new data is constantly interpreted in the failed framework of evolution, regardless of how well it fits, demonstrates the importance of presuppositions and the prior commitment to a naturalistic explanation. As invertebrates diversified in “prehistoric” oceans, evolutionists suggest that their nervous systems became more complex and that structures that sense the environment (light, vibration, chemical detection, etc.) gave these new animals an advantage. External skeletons developed in the ocean and allowed animals the opportunity to invade the land where the plants that had already evolved to survive on land could provide many open niches and food sources. Another interesting observation comes when you analyze the dates given in different textbooks. Many of the evolutionary “milestones” and “first” fossils are given extremely different dates in different textbooks. This is true in most cases, from bacteria to the “most recent” divergent paths in evolution. The age of the first animal fossils differs by 100 million years between textbooks, and many other dates differ by varying degrees depending on which authority you use. The variation in dates given by different experts exposes the speculative nature of evolutionary storytelling, regardless of the supposedly objective nature of science. Note: Many of the topics in this section are not dealt with specifically in articles, but the references refer to general arguments that can be applied to specific cases. No articles discuss the details of mollusk evolution, for example, but the arguments for common ancestry, homology, and fossil evidence can be applied to this specific example, as well as other specific cases. The PBS series The Shape of Life claims that the presence of a common stretch of DNA in all animals points to sponges as the ancestor of all animals. Since fossil sponges from China remarkably resemble living sponges, how can these ancestral sponges remain unchanged for hundreds of millions of years? The fact that animals share common DNA sequences is just as much evidence for a common designer as it is for common ancestry. According to classic evolutionary belief, no animals other than single-celled creatures are supposed to be present in rocks which are dated at more than 580 million years. What appear to be unmistakable worm burrows have now been found in rocks which date around 1.1 billion years. The consistent diameter of the markings helps to identify them as worm burrows and puts worm fossils several hundred million years before animals were supposed to have evolved from colonial protists. Worms have always been worms; they were made on Day 6 of Creation Week. The evolution of echinoderms is believed to be distinct from other invertebrates because of their deuterostome development pattern. Because vertebrates share this feature, echinoderms share an alleged common ancestor with vertebrates. The fact that flight evolved in one group is a secular miracle in itself, but that it has evolved in many different groups at different times is amazingly improbable. Research involving stick insects has created a major change in evolutionary thinking. Some stick insects have wings, but some do not. Traditional evolutionary logic would suggest that the ancestor of the stick insects had wings and that some groups have lost that information. Dollo’s Law suggests that once the insects lost the ability to produce wings they would not re-evolve the ability. This principle was challenged by the stick insect research, which shows that wings were lost and gained in cycles over spans of hundreds of millions of years. Leaving a set of genes “dormant” for 100 million years guarantees that mutations will accumulate in the genes while they are not expressed and being acted on by natural selection. If these genes are activated after 100 million years, they will not be able to produce wings as they did before. 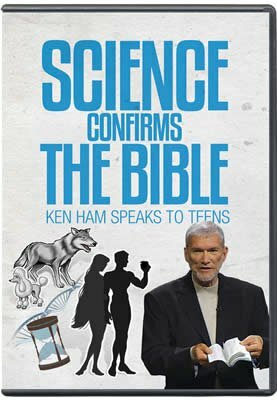 This contradictory evidence is then used to show how wings, and other features, could re-evolve. Again, this evidence supports the biblical creation model. Insects of the same kind had a wide variety of genetic information preprogrammed into them when they were created. How exactly did colonial organisms get the information required to code for all of the proteins and hormones needed to form different types of cells? How did colonial organisms share genetic information so that a single cell could develop into many cells that perform different functions? Has this ever been replicated in the lab? Does the ability of some new trait (“evolutionary milestones”) to give an advantage, like bilateral symmetry, make it likely to evolve? Does evolution offer predictable claims about what advantages are expected to enhance survival? If we don’t know what to look for in evolutionary change, how do we know when it has occurred? The dates for the “first” organism of many types of invertebrates seem to be getting older and older as new fossils are found. What will happen to evolutionary theory if there is basically no time between the ancestor and the descendant?